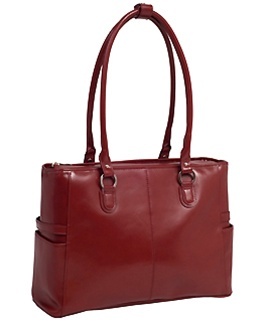 A business case designed for women to tote everything with style! It is possible to carry your documents, business necessities or even a laptop while still being fashionable. Reach for a McKlein WILLOW SPRINGS tote. Built-in high-density compartment protects laptops up to 15.4” in screen size. 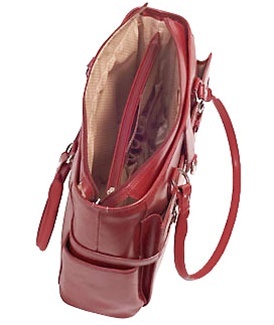 Main compartment features an interior zipper pocket and an interior organizer for pens, business cards and small devices. Weighs less than 3 lb. The McKlein philosophy is as devoted to innovation as it is committed to ensuring the finest quality business cases, computer cases, luggage and accessories. McKlein stands behind the distinct quality, craftsmanship, and performance of all our products. McKlein uses only the finest materials and employ rigorous quality control standards with each and every design to create durable, luxurious and high performance products. To this end, McKlein actualizes its commitment to excellence with a limited lifetime warranty. Every McKlein case is made, from the finest materials available, in our own state-of-the-art manufacturing facility. But, like any other product, it is not indestructible. Therefore, our warranty does not cover product damage that may result from normal wear and tear, abuse or mishandling of the product. It should be expected that component parts - particularly leather, moving parts, handles and wheels - will show wear with use over time, and eventually may need to be refurbished or replaced. McKlein will always be happy to provide you with fast and reliable, high-quality repair service at a nominal cost. (If an airline or other carrier damages your luggage, you should immediately file a damage claim with the carrier.) McKlein does not cover incidental or consequential damages, such as loss or damage to the contents of the bag. In the unlikely event that a problem arises as a result of a defect in our materials or workmanship, McKlein pledges to promptly repair the item at our expense (or replace it if it cannot be repaired). All we require is that you call us first, and then send your bag to the repair location that we indicate. Our website (www.McKleinUSA.com) includes some helpful suggestions to properly care for and extend the life of your case. This warranty gives you specific legal rights, and you may also have other rights, which vary from state to state. (Some states do not allow the exclusion or limitation of incidental or consequential damages, so the above limitation may not apply to you.) You will find that we apply the same standard of excellence to our customer service as we do to our products. Note: Damage caused by a common carrier is, by federal law, the carrier's responsibility and must be claimed with the carrier at the time it occurs. In the event that your product should need repair work, please follow the instructions listed below. Step 1: Download a service request form. Complete the form and send it to info@mckleinusa.com Please be sure to include the proof of purchase, your name, address, and a brief description of the service issue. We will generate an RA service request number for you via e-mail within 24 hours once you submit the form. Step 2: When you receive an RA service request number, package the item and write your RA number on the outside of the box.